Picasa began as the product of a Pasadena, California company by the same name. That company was founded in October, 2001. Google bought the company in May, 2004. I ran it for a couple days in “Kanotix 2005-04” and it does indeed run. It scanned my 160 hard drive, finding all my pictures, and never crashed. I was able to print two in full color,rotate images, you name it. My K-mail even worked smoothly, and as slowly as in the windows version. I even here that future versions of Picasa will be true linux apps from the ground up. Linux users can hope. 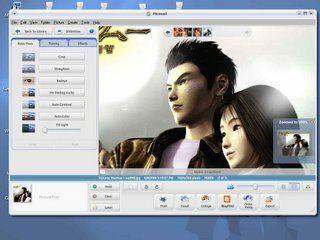 Picasa is one of many programs found on the klik site. For most of the 4000+ packages available from the klik warehouse, the "download" consists of a "recipe". The recipe tells the klik client where to fetch the binaries from (in most cases .deb packages from the official Debian repositories), how to unpack them, and how to re-package and compress them into the final .cmg image. So the klik client does most of the work and builds its own .cmg file in most cases.